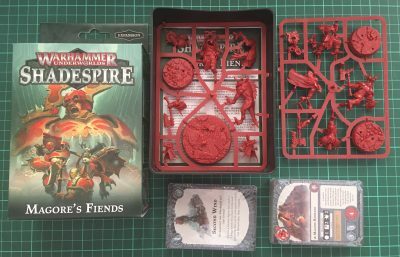 These expansions fit a fair bit into the box – there’s a plastic tray containing two decks of cards, and two sprues of models. 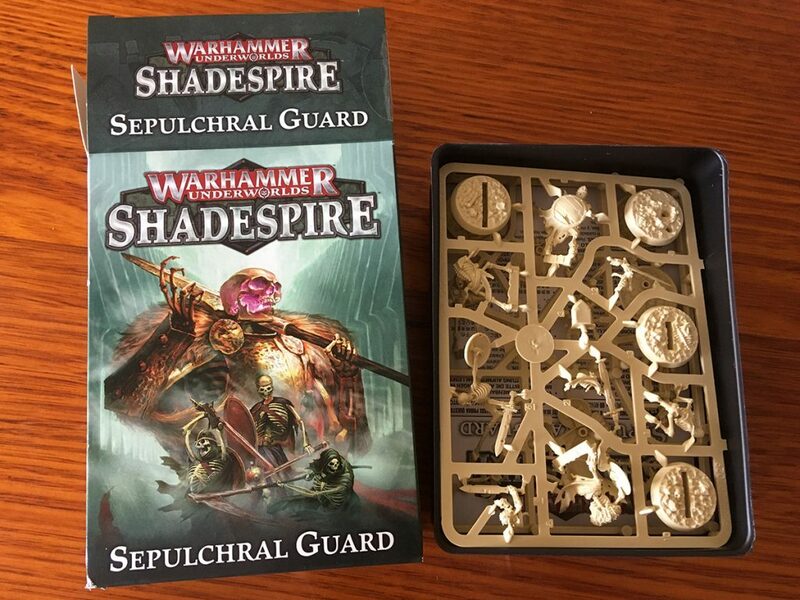 The Sepulchral Guard have been part of the Shadespire hype since the first pictures of the Warden were released, and the rapidly depleted stock levels in my local store suggest that this one is going to be a popular warband. The models are lovely – every figure is visually distinct, so it’s easy to identify even the petitioners mid-game. The Harvester and Warden are both impressive heroes. The Prince and Champion are a little closer in appearance to the rank and file. 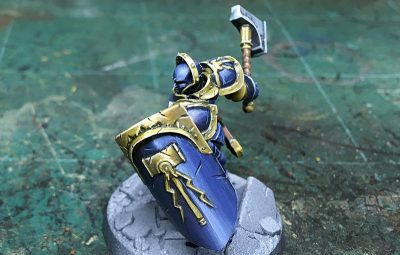 I’ve updated my Shadespire card list with details on all the new Power and Objective cards. The undead-specific cards are all very characterful, with ploys that let the Warden slip away from pursuers, raise even more fallen skeletons, and some damage boosters for the four named characters. Mob tactics feature heavily in Sepulchral Guard objectives, from Claim the City to March of the Dead and Undead Swarm, and some new generic objectives that reward grabbing multiple objectives in the same turn. 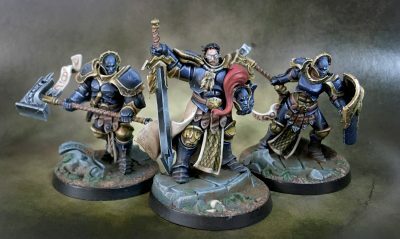 There are some great, thematic objectives for the undead in there – like More Able Bodies (score when you’ve taken out 2+ enemies in the preceding Action phase), Battle Without End (score after returning 2+ friendly fighters to the board) and The Invigorated Dead (score when all your remaining models are Inspired. One of my favourite aspects to the new expansion is the addition of more Shadespire-themed generic cards to the game. These are much more interesting than the plain-but-useful +1 Wound or +1 Damage options: things like finding a powerful, single-use Shadeglass Sword, shattering the terrain underfoot, or using the mirror reflections to misdirect opponents. 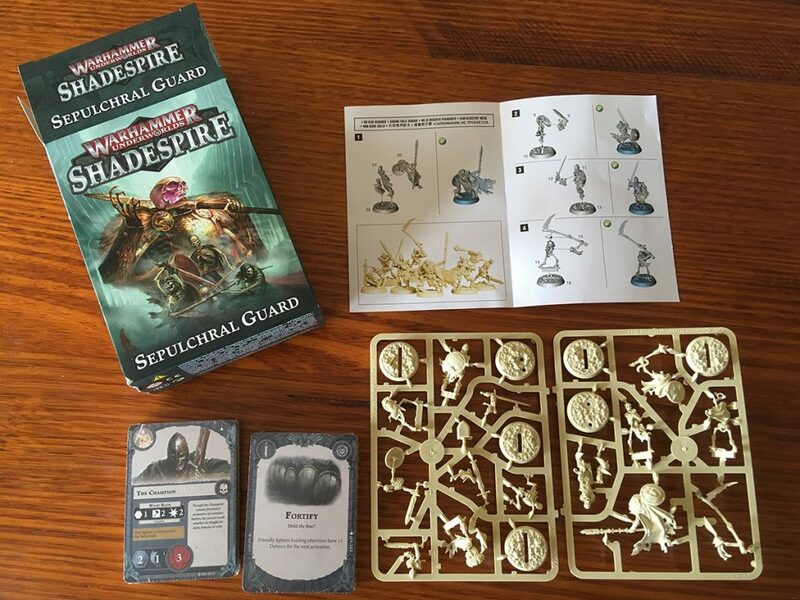 Much like Warhammer Quest: Silver Tower stamped its own unique “new-Warhammer” lore on every aspect of that game, the new cards really help to make this feel like you’re playing in an previously unexplored corner of the Age of Sigmar setting. It’s becoming much more than just another generic fantasy arena combat game, and I think it bodes well for the rest of the warband expansions still to come.